"Walk For Animals, Walk For PEACE" is a peaceful, positive way to show solidarity with animal rights, human rights and other intersectional causes which promote nonviolence. Join us every year in Houston to walk for animal liberation and peace for ALL! Our first Walk was in October 2016, in partnership with the Mahatma Gandhi Library of Houston. Vegan Society of P.E.A.C.E. is pleased to present our 3rd Annual "Walk for Animals, WALK FOR PEACE" in partnership with the Mahatma Gandhi Library of Houston "Walk For Peace"! We're very honored to be hosting this in partnership with the Mahatma Gandhi Library of Houston "Walk For Peace" as part of their "1000 Lights for Peace"! This is a large outreach event for our nonprofit organization. It also takes place the week after our Texas Go Vegan Week! The "Walk for Animals, WALK FOR PEACE" 5K Walk is a peaceful, all-ages, family friendly event! It's a positive way to show solidarity with animal rights, human rights and other intersectional causes which promote nonviolence. The 5k Walk is held every October in partnership with the Mahatma Gandhi Library of Houston. Join us in solidarity as we walk together on October 14 -- for the Animals, for Nonviolence, for PEACE! Registration is requested for participation in the Walk. Advance registration includes the new 2018 "Walk For Animals" T-shirt, a Vegan Society of P.E.A.C.E. tote bag, vegan protein snack, coupons and a reusable souvenir water bottle. T-shirts and totes can be picked up at the Vegan Society of P.E.A.C.E. Outreach Booth at Miller Outdoor Theater. (Registration is considered a donation and helps cover the costs of shirts, totes and to support our outreach efforts.) In case of inclement weather preventing the outdoor 5K Walk, registered participants will still receive their shirts, totes and reusable water bottles. Participants are encouraged to wear the Walk For Animals, WALK FOR PEACE shirts or the Gandhi 1000 Lights for Peace shirts. We have a new shirt design this year! Peaceful, nonviolent signs will be provided by VSOP. Park rules must be followed and dogs are welcome on leashes. *Please no masks, posters with images of violence, signs with profanity or leafleting during the Walk. Park rules must be followed. Dogs are welcome, but must be on leashes. Children must be supervised at all times. Please no leafleting, as literature will be handed out directly from our outreach booth and any signs will be provided by VSOP. After the 5K Walk, please stay for the Mahatma Gandhi Library's "1000 Lights for Peace" event at Miller Outdoor Theater! Participants are encouraged to wear the 2018 WALK FOR PEACE shirts. They will be a great souvenir! 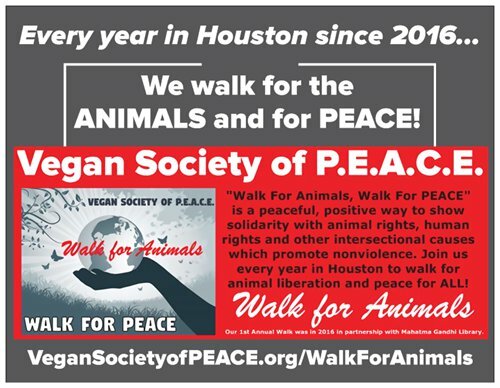 "Walk for Animals, WALK FOR PEACE" is a project of the Vegan Society of P.E.A.C.E., in partnership with the Mahatma Gandhi Library of Houston. "Mahatma Gandhi Week", "Walk for Peace" and the "Houston 1000 Lights for Peace" are created by the Mahatma Gandhi Library of Houston. "Walk for Animals, WALK FOR PEACE" is © Copyright Vegan Society of P.E.A.C.E. - All Rights Reserved.